My Country Roads: Wild and Wonderful : Thank you so much! From the bottom of my heart, I want to thank you all for your warmth birthday greetings and wishes for me. For those who posted something speciall for me and for everybody who came to greet me and sung me a song on my blog, Salamat, gracias, thank you! 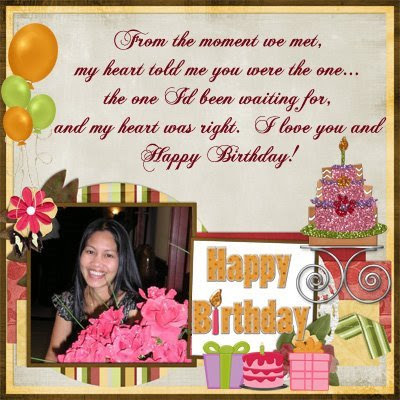 From my ever loving and caring husband, John..
From my ever supportive and sweet sissy Dhemz! 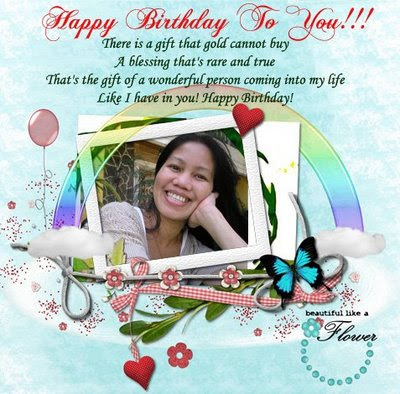 From my mentor in blog and the reason why I am enjoying the blogging world to the max, Malou.. thanks bru. From my Kumareng Fe from Germany.... Goodluck Mads! From my ever helpful and thoughtful ate Cecille. And to all of you guys who really spent time coming to my blogs and greeted me on my special day. You really made it so special. Thanks a bunch. Kamsa hamnida! hi sistah. happy birthday ulit sa yo..pangatlong bati ko na ata ito hahaha..anyway, God bless you!mwah! I am sorry I missed your special day, hope you had fun. Thank you for coming by. Those special birthday cards are nice, I have not learned how to do that yet. Ayyyyy I hope di ako ang pinakahuling bumabati nang Happy Birthday to you!!! I pray for good health, happines and wealth forever. Take care and God bless! thanks for this...and you are so welcome, dear :-)! A Very Happy Belated Birthday! I'm so sorry I missed it! I'm glad it was a good one! You deserve it girl. Happy Birthday ulit. Thanks for changing the URL ha. Added this blog too in my new list, nakakalito hahaha....hard work pala ito. LOL. Happy Birthday uli Ate Rose! !Wishing you the best of this world can offer! !^_^Ang sarap ng maraming friends here at blogosphere!